The forecasted un-fall-like temps in NYC this weekend (83 degrees! Sans humidity!) have it feeling almost appropriate that I haven't updated KLB since it really was summer — I've been much too busy to find the time to prepare and shoot even one meal to share; and sad about it, too. But I did make this ridiculously delicious pasta dish a few weekends ago before the much-too-busy set in. It's pure vegetarian (vegan), fairly quick to pull together, and minimally messy to prepare. I loved it so much, I made it two weekends in a row! 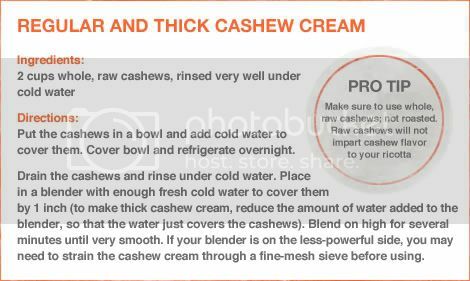 Some side notes: The recipe does require Cashew Cream, so that's something you'll want to plan for in advance (that just means have raw cashews on hand that have been soaked in water overnight). 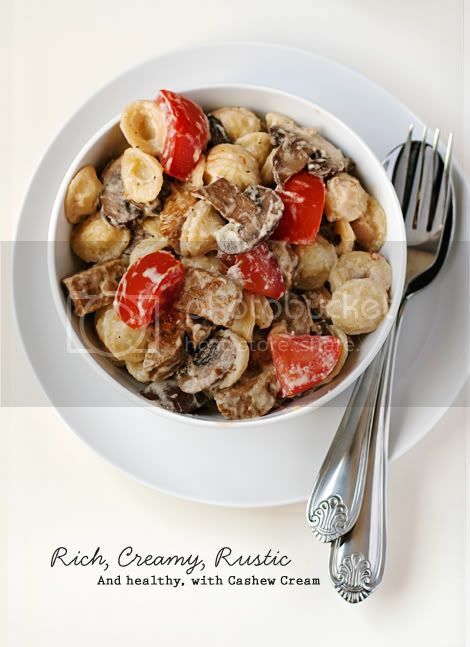 I used orecchiette pasta in the dish mostly because I love the way the "little ears" catch the sauce, and their thick, chewy bite; but I can also imagine this recipe working well with fettuccine or small shells. Also, be sure to use Baby Bella mushrooms instead of white button mushrooms. Baby Bellas are tan/brown in color and provide a more full-bodied, meaty flavor. And one last note: I used soy creamer along with Cashew Cream in my sauce. There are other vegan creamer options on the market, such as coconut creamer — use an option other than soy creamer at your own risk! Plain soy creamer, in my experience, works best in vegan cream sauces because it will not impart any strange flavors or give an aftertaste — your vegan cream sauce will taste like dairy cream sauce. 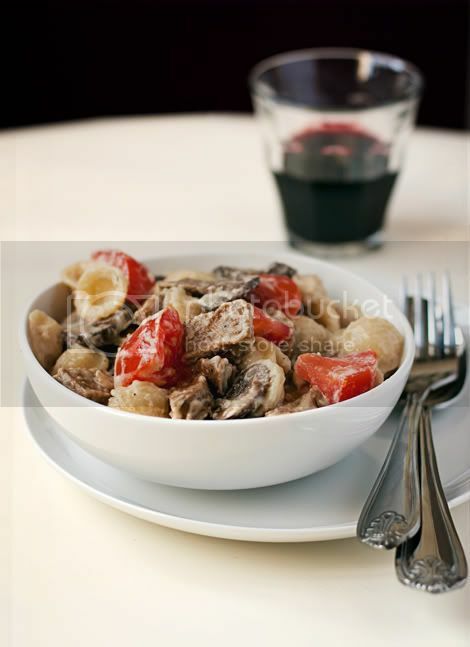 • 1 lb (1 package) orecchiette pasta, cooked according to package instructions and drained with some cooking water reserved Note: when cooking your pasta, be sure to add 2 - 3 tablespoons kosher or sea salt to the boiling water before adding the pasta. Prepare the mushrooms and onions: Melt about 1 tablespoon of Earth balance in a large skillet over medium-low heat. Add sliced mushrooms and onions, salt generously, and add a few dashes of pepper, to taste. Cook mushrooms and onions, stirring occasionally, sweating them until they are soft and floppy, but not swimming in their own juices. Once the onions and mushrooms are close to being ready, add the veggie sausage links to the pan and brown for 2 minutes on each side. Turn off heat, and remove sausages to a cutting board. Slice sausages lengthwise down the center, and then into 1/4-inch pieces. 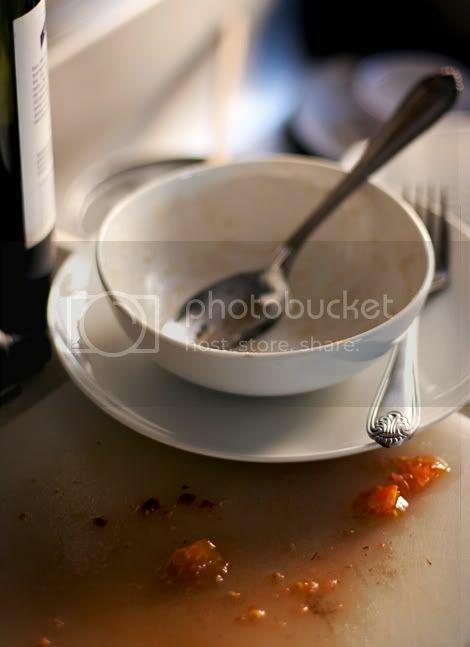 At the veggies are cooking, prepare the cream sauce: Melt Earth Balance in a small saucepan over low heat. Add flour and stir until completely combined. Add cashew cream and Silk creamer, and continue stirring for 1 minute. Add lemon juice, and white pepper. Continue to stir and cook until sauce thickens, about 3 to 5 minutes. Prepare the pasta dish: Add the cooked pasta to the veggies in the skillet and toss to combine. Pour the sauce over the pasta and veggies mixture. Stir and toss to coat. Add the sliced sausage, season more with salt and freshly ground black pepper, if desired; stir and toss to mix in. Serve immediately.